Animal husbandry or animal agriculture is the management and care of farm animals by humans, in which genetic qualities and behavior, considered to be advantageous to humans, are further developed. The term can refer to the practice of selectively breeding and raising livestock to promote desirable traits in animals for utility, sport, pleasure, or research. 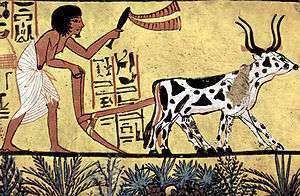 Animal husbandry has been practiced for thousands of years since the first domestication of animals. Selective breeding for desired traits was first established as a scientific practice by Robert Bakewell during the British Agricultural Revolution in the 18th century. One of his most important breeding programs was with sheep. Using native stock, he was able to quickly select for large, yet fine-boned sheep, with long, lustrous wool. The Lincoln Longwool was improved by Bakewell and in turn the Lincoln was used to develop the subsequent breed, named the New (or Dishley) Leicester. It was hornless and had a square, meaty body with straight top lines. These sheep were exported widely and have contributed to numerous modern breeds. Under his influence, English farmers began to breed cattle for use primarily as beef for consumption - (previously, cattle were first and foremost bred for pulling ploughs as oxen). Long-horned heifers were crossed with the Westmoreland bull to eventually create the Dishley Longhorn. Over the following decades, farm animals increased dramatically in size and quality. In 1700, the average weight of a bull sold for slaughter was 370 pounds (168 kg). By 1786, that weight had more than doubled to 840 pounds (381 kg). Animal herding professions specialized in the 19th century to include the cowboy in the United States and Canada, charros and vaqueros in Mexico, gauchos and huasos in South America, and stockmen in Australia. In more modern times herds are tended on horses, all-terrain vehicles, motorbikes, four-wheel drive vehicles, and helicopters, depending on the terrain and livestock concerned. Today, herd managers often oversee thousands of animals and many staff. Farms, stations and ranches may employ breeders, herd health specialists, feeders, and milkers to help care for the animals. Techniques such as artificial insemination and embryo transfer are frequently used today, not only as methods to guarantee that females breed regularly but also to help improve herd genetics. This may be done by transplanting embryos from high-quality females into lower-quality surrogate mothers - freeing up the higher-quality mother to be reimpregnated. This practice vastly increases the number of offspring which may be produced by a small selection of the best quality parent animals. On the one hand, this improves the ability of the animals to convert feed to meat, milk, or fiber more efficiently, and improve the quality of the final product. On the other, it decreases genetic diversity, increasing the severity of certain disease outbreaks among other risks. 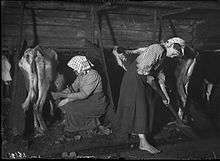 Dairy cattle in Mangskog, Sweden, 1911. The semi-natural, unfertilized pastures formed by traditional agricultural methods in Europe, were managed and maintained by the grazing and mowing of livestock. Because the ecological impact of this land management strategy is similar to the impact of a natural disturbance, the agricultural system will share many beneficial characteristics with a natural habitat including the promotion of biodiversity. 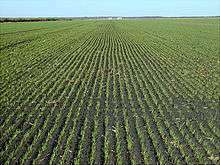 This strategy is declining in the European context due to the intensification of agriculture, and the mechanized chemical based methods that became popular during and following the industrial revolution. Good husbandry practices (GHP) are a set of rigorous standards whose purpose is to ensure the health of the animals for the production and procurement of products for human consumption. The checks that are performed within the framework of good husbandry practices tend to reduce the mortality of these animals, and therefore, the spending to cover expenses for illnesses, medications and lost production. Furthermore, these practices are based on recommendations in order to optimize efficiency in production levels, with high social content that respects the environment and the conditions of individuals who develop tasks related to the agricultural sector. Also the GHP set in the protocol the actions to implement for the waste removed from injury, dissection, and milking. The rules addresses methods for separation of solid and liquid waste materials. This intended to prevent blockages in pipes and hoses, in order to limit environmental pollution. Similarly, techniques are expected to separate organic matter colloids (establishment of stabilization ponds). In the same protocol it is important to take into account the costs incurred at each stage and the materials and substances to be used. Livestock or livestock feed occupies 1/3 of the earth’s ice-free land. Animal agriculture is the leading cause of species extinction, ocean dead zones, water pollution, and habitat destruction. Animal agriculture contributes to species extinction in many ways. In addition to the monumental habitat destruction caused by clearing forests and converting land to grow feed crops and for animal grazing, predators and "competition" species are frequently targeted and hunted because of a perceived threat to livestock profits. The widespread use of pesticides, herbicides and chemical fertilizers used in the production of feed crops often interferes with the reproductive systems of animals and poison waterways. The overexploitation of wild species through commercial fishing, bushmeat trade as well as animal agriculture’s impact on climate change, all contribute to global depletion of species and resources. Livestock operations on land have created more than 500 nitrogen flooded deadzones around the world in our oceans. Near 1/3 of the planet is desertified, with livestock as the leading driver. A farm with 2,500 dairy cows produces the same amount of waste as a city of 411,000 people. Due to the significant contribution of agriculture to the emissions of non-CO2 greenhouse gases, such as methane and nitrous oxide, the relationship between humans and livestock is being analyzed for its potential to help mitigate climate change. Strategies for the mitigation include optimizing the use of gas produced from manure for energy production (biogas). Livestock and their byproducts account for at least 32,000 million tons of carbon dioxide (CO2) per year, or 51% of all worldwide greenhouse gas emissions. Livestock is responsible for 65% of all human-related emissions of nitrous oxide – a greenhouse gas with 296 times the global warming potential of carbon dioxide, and which stays in the atmosphere for 150 years. Cows produce an average of 150 billion gallons of methane per day. ↑ "Animal husbandry". Encyclopaedia Brittanica. Retrieved 5 June 2013. ↑ Jarman, M.R. ; Clark, Grahame; Grigson, Caroline; Uerpmann, H.P. ; Ryder, M.L (1976). "Early Animal Husbandry". The Royal Society. 275 (936): 85–97. doi:10.1098/rstb.1976.0072. ↑ "Robert Bakewell (1725 - 1795)". BBC History. Retrieved 20 July 2012. 1 2 3 Pykala, Juha (2000). "Mitigating Human Effects of European Biodiversity Through Traditional Animal Husbandry". Conservation Biology. 14 (3): 705–712. doi:10.1046/j.1523-1739.2000.99119.x. ↑ "Buenas Prácticas Ganaderas (BPG) para la producción y comercialización porcina familiar - INTA :: Instituto Nacional de Tecnología Agropecuaria". ↑ "Buenas Prácticas Pecuarias (BPP) para la producción y comercialización porcina familiar" (PDF). Fao.org. Retrieved 2016-08-28. ↑ Candela Barceló1; María Irina Pipa1; Ignacio Roberto Huerga. "Problemáticas y oportunidades ambientales de la producción porcina familiar" (PDF). Ciap.org.ar. Retrieved 2016-08-28. ↑ Mekonnen, Mesfin M.; Arjen Y. Hoekstra (2012). "A Global Assessment of the Water Footprint of Farm Animal Products" (PDF). Water Footprint Network. ↑ "The water footprint of poultry, pork and beef: A comparative study in different countries and production systems". Science Direct. ↑ "Biomass use, production, feed efficiencies, and greenhouse gas emissions from global livestock systems". US National Academy of Sciences. ↑ "Freshwater Abuse and Loss: Where Is It All Going?". Forks Over Knives. ↑ "Livestock a major threat to environment". Food and Agriculture Organizations of the United Nations. ↑ "Livestock impacts on the environment". FAO. Archived from the original on August 28, 2015. 1 2 "Risk Assessment Evaluation for Concentrated Animal Feeding Operations". U.S. Environmental Protection Agency – Office of Research and Development. 2004. ↑ "what is a dead zone". NOAA. ↑ "What Causes Ocean "Dead Zones"?". Scientific America. ↑ "What's the Problem?". United States Environmental Protection Agency. ↑ "Livestock's Long Shadow: Environmental Issues and Options". Food and Agriculture Organization of the United Nations. 2006. ↑ "The Causes of Extinction". The Encyclopedia of Earth. ↑ "Unit 9: Biodiversity Decline // Section 7: Habitat Loss: Causes and Consequences". Annenberg Learner. ↑ "Biodiversity conservation: The key is reducing meat consumption". Science Direct. ↑ "Press Release" (PDF). Louisiana Universities Marine Consortium. 2014. ↑ "NOAA-, EPA-supported scientists find average but large Gulf dead zone". NOAA News. 2014. ↑ "UN launches international year of deserts and desertification". UN news centre. 2006. ↑ "Overgrazing". The Encyclopedia of Earth. ↑ "Desertification, Drought Affect One Third of Planet, World's Poorest People, Second Committee Told as It Continues Debate on Sustainable Development". UN. ↑ "Saving the World With Livestock? The Allan Savory Approach Examined". Free From Harm. ↑ "Causes of Deforestation of the Brazilian Amazon" (PDF). World Bank. ↑ Margulis, Sergio (2003). "Causes of Deforestation of the Brazilian Rainforest". Washington: World Bank Publications. ↑ Monteny, Gert-Jan; Andre Bannink; David Chadwick (2006). "Greenhouse Gas Abatement Strategies for Animal Husbandry, Agriculture, Ecosystems, and Environment". Agriculutre, Ecosystems, and Environment. 112 (2–3): 163–170. doi:10.1016/j.agee.2005.08.015. Retrieved 5 June 2013. ↑ Goodland, Robert; Jeff Anhang (2009). "Livestock and Climate Change: What if the key actors in climate change were pigs, chickens and cows?". Worldwatch Institute, Washington, DC, USA: 10–19. ↑ "'comment to editor' Goodland, Anhang". Animal Feed Science and Technology. ↑ "Study claims meat creates half of all greenhouse gases". The Independent. 2009. ↑ Ross, Philip (2013). "Cow farts have 'larger greenhouse gas impact' than previously thought; methane pushes climate change". International Business Times. Look up husbandry in Wiktionary, the free dictionary. Wikisource has the text of the 1920 Encyclopedia Americana article Breeding.